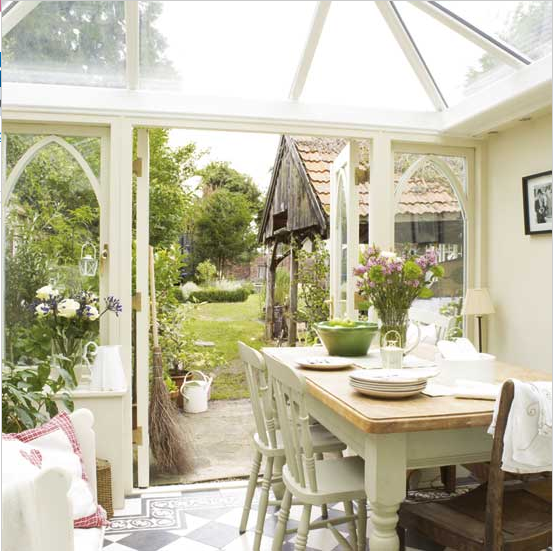 Today’s conservatories are more than a square extension on the back of our homes. Home owners want their conservatories to seamlessly join their properties and to blend in with the homes interior design style. The way you use your conservatory will dictate how you decorate the space, the style of the actual conservatory will also play a part on how the room will best be decorated. If you are considering redecorating your conservatory or planning to add a new conservatory, then you may want some inspirational decorating ideas. In this article we are going to look at 3 different styles; modern, traditional and country all of which work well when it comes to decorating your conservatory. The lean to conservatory has the most modern and contemporary feel, its simple roof and clean straight lines is the perfect choice for anyone wanting the most up to date design. Keep it simple and uncluttered enjoy the simplicity of the design and the light airy feel the lean to roof provides. A splash of dramatic colour does work well if used carefully for example; a colourful centre piece, brightly coloured blinds or a collection of contrasting scatter cushions in a variety of colours. Two styles that work really well when wanting a traditional design would include; the Gable End and the Victorian conservatory. The gable end conservatory adds a sense of grandeur to any home providing a light airy feel, giving it a distinctive appearance typical of this period spanning from 1760-1820. The Victorian conservatory with its steeply pitched roof and ornate ridge details gives this style of conservatory a classical appearance. Add flooring such as wooden planks, flagstones and cover with rugs this gives you a good foundation to work on. From there build upwards using furnishings that compliment a traditional style these could include chesterfield leather sofas, wooden book cases, candelabra’s, and a great feature would be to add a wood burning stove to cosy up to during the long winter nights. Any of the conservatory designs would work well when wanting a country styled conservatory room, it’s how the decoration is done and what accessories are added that will define this style. Use soft florals in the soft furnishings and accessories, combined this with patterned, striped and gingham accessories. Wicker baskets mixed into the design will create a countryside feel as will freshly cut flowers. The use of painted wrought iron furniture or distressed painted furniture will help pull the design together. The country style works really well in a conservatory as it complements the garden and brings the room and garden together.